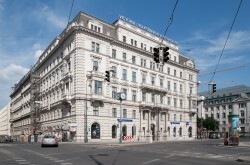 The financially stricken Austrian VBAG will cut its equity capital by around 70 and then top it up again with state aid next month as part of a previously announced bailout. VBAG laid out its plans in an invitation to its annual shareholders' meeting on April 26 published in Austria's official bulletin on Wednesday. The Austrian government has said it aims to sell by 2017 the big minority stake in Volksbanken it will get by rescuing the ailing lender in a bailout partially funded by fellow banks.